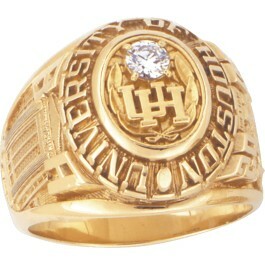 The interlocking UH logo adorns the top of the official class ring. The right shank presents the University seal — a variation of Sam Houston’s coat of arms — that features flanked martlets, two greyhounds, and a winged hourglass with the motto “In Time” above it. The wearer’s graduation year is also featured on this side. The left shank bears the wearer’s degree, a facade of the Ezekiel Cullen Building, and the University’s founding date, 1927. Rings are available in either yellow or white gold with options such as antique finishes and diamond settings. Tradition dictates that current students wear the ring facing inward. Only alumni should wear the ring with the logo facing outward. 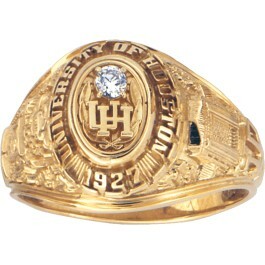 Starting in December of 2011, UHAA and the Houston Zoo partnered to have all official UH Class Rings spend the night prior to the Fall Ring Ceremony in the cougar exhibit with Haley the cougar. 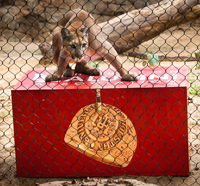 In March of 2012, the university’s new live mascot, Shasta VI was unveiled at the Houston Zoo and the rings now spend the night with Shasta VI prior to every Ring Ceremony. Stay tune for Spring 2019 Blessing of the Rings information! Only official class rings made by Balfour will be allowed to participate in the Ring Ceremony. Cash Parking ($5) will be available in lots 16B and 16C across the street from Fertitta Center. Cash and credit cards will be accepted. See map below. Doors will open at 2pm for check-in. 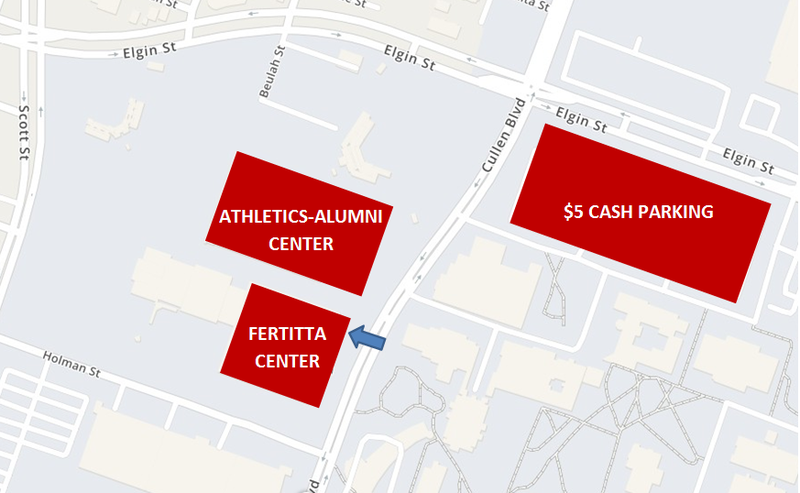 Please enter Fertitta Center from the Cullen Blvd entrance. Shown on map below. 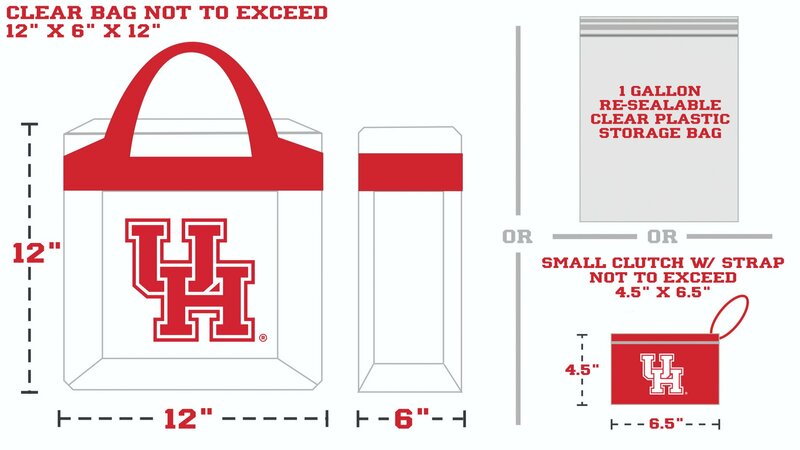 Only those individuals receiving rings will need to check in at the tables inside Fertitta Center, your guests may proceed to their seats. Those receiving rings will be seated in a designated section, and our staff will direct you to it. During the ceremony, ring recipients will be walking across the stage. If any ring recipients require assistance to walk up onto and across the stage, please let us know. 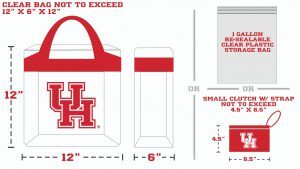 A clear bag policy is in effect for Fertitta Center. Please share with your guests! More information below. Have you completed 70 hours of coursework towards your degree? Order your class ring online now and flash it in front of jealous underclassmen. You can see ring samples and get sized any time in the Alumni Relations Office – Suite 201 of the Athletics-Alumni Center.